Suspended above the three circuit canvas labyrinth created by Medwyn during her 2012 residency at Artscape Gibraltar Point, the Dream Scroll returned to Vancouver, the city of its birthing during the 2011 Gestare residency at the STAG. 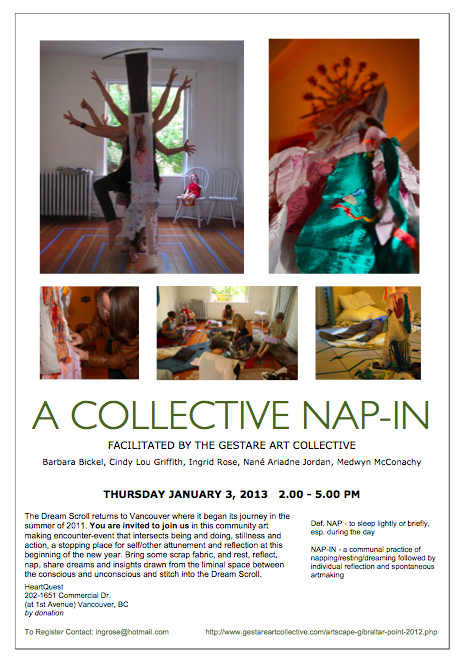 Co-creators and collaborators from the Collective's Vancouver community were facilitated by Barbara Bickel, Cindy Lou Griffith, Medwyn McConachy and Ingrid Rose in a Nap-in experience. The group entered dreamspace through light journeying to the gentle beat of the Tar drum. Textile art pieces expressed the dreams, insights and quiet reflections drawn forth from the collective napping, and the Dream Scroll was further enriched through receiving the newly created art.